Welcome to the forty-ninth Weeknight Dinner Recap! Can you believe it? We are almost at a full year of reviewing our dinners and sharing our favorite flavors with you. And making them all gluten free, of course! This week featured a set of meals you can easily find - they’re all online! In the Source section of each dish, I list the recipe's author, where it came from, and a link directly to it! I hope you’ll make some of these awesome dinners. I could barely pick a favorite as they were each unique in their own delicious, crave-worthy way. And, before we begin, let me remind you that all of the ingredients we used for these meals are available at Wilson Farm in Lexington, MA. Our favorite one-stop-shop for everything we need to make dinner. We partner with Wilson's because we love local, farm-fresh produce, family-run businesses, and supporting a farm that really has it all. So, let's get to the dinners of the week! Source: Recipe by Claire Saffitz for Bon Appetit's Basically. You can find it here. GFMD: The only change necessary for this meal is to use gluten free breadcrumbs instead of regular. We use breadcrumbs by the brand Aleia’s Gluten Free Foods and they are fantastic. Outcome: Is there anything better than the ease of a sheet pan dinner? And, with that, is there anything more satisfying and delicious than making delicious chicken meatballs on said sheet pan? My answer is a hearty “no” on both accounts because sheet pan dinners are pretty darn awesome. And chicken meatballs are so versatile and fabulous you’ll wonder why it’s taken you this long to finally make them. Well, question no longer because I found this recipe online and this dinner can be yours, too! You’re welcome x 10,000. Not only was this dinner super easy to put together and put on the table in way under an hour (I think it was about 35 minutes, maybe less? ), but the flavor to effort ratio was off the charts. And that’s what is most exciting! To me at least. You may prefer sweating it out in the kitchen for hours. I personally don’t prefer that. Especially when I’m really hungry. The secret to those meatballs - wait. Let me state again that I really, really love chicken meatballs - meatballs in general - because of their versatility, (usually) quick cook time, and general joy they can bring to a meal. Meatball is a fun word! It’s a ball of meat! Where can you go wrong? I most certainly will always choose meatballs as one of my preferred protein powerhouses since I love making them, eating them, and trying them out in all different forms. To-date, we have made meatballs using beef, pork, turkey, lamb, and chicken on several different occasions and each one I have proclaimed to love. What can I say? I’m a major meatball fan. And these, in particular, were fabulous. So, the secret to this entire sheet pan of goodness was the use of harissa (a blend of hot peppers, garlic, and more). A spice that’s bold and awesome, but can also seem slightly tame if you don’t use too much. We used the recommended amount which made our meal spicy for sure, but not inedible, which is a good balance, I think. arissa is a spice that you should get to know; it’s really yummy and can bring a whole new flavor palette to your plate. Hooray for harissa! If you couldn’t guess already, then maybe I’m not being obvious enough: this is an amazing, easy dinner! Pulled right from the easy + yummy area of Bon Appétit online, their recipe section Basically, wanted this meal as soon as I saw the title and was so thrilled that it was as great as I had hoped. I’d love to have this dinner again because it was delicious and I love meatballs. But I’d love to have it again with some friends or family because yum like this deserves to be shared. Source: Recipe is from Bon Appétit online, find it here. GFMD: This dinner is naturally gluten free! Slab bacon is gluten free, but just make sure the package says so, too. Outcome: Of course I love the awesome BLT sandwich. I’m not a monster. In fact, I’d dare to say it’s one of the coolest sandwiches out there, flying under the radar of the turkey club, the Reuben, or the meatball sub (just go with it). While the BLT may not be as involved as those others, what I appreciate most about it is the simplicity of ingredients. All together they make a big impact which is why I thought this salad version would be just as satisfying and fun. Thankfully, I was right! The concept is easy: a bowl of kale with tomatoes, light dressing, and thick, awesome bacon. The creation is even easier! While that slab bacon cooks away, get the dressing ready, wash the kale, and chop the tomatoes. Before you know it, the bacon has cooked and all you have to do is put it all in a bowl, toss, and enjoy! How simple! Much like its sandwich sister, this kale BLT salad is quick to prepare, but ultra-delicious and appears somewhat fancier than it actually is. But don’t tell anyone! I have a feeling this dish would be great for a BBQ or another summer social gathering where a “fancy-looking salad” would be a popular buffet item. Source: Recipe by Claire Saffitz for Bon Appétit, find it here. GFMD: We chose to skip finding GF croutons in favor of making the ultra-crispy Parmesan crisps instead. I’d say they are even better than a crouton and naturally gluten free - they are just cheese! Otherwise, the entire salad is naturally gluten free! Outcome: Now, I stressed this on my Instagram post about this salad, but I’ll state my mindset again here: I love Caesar salad and I love ordering them at restaurants. I find them comforting, easy, delicious, and kind of hard to mess up. What I also love about them is how easy they are to embellish with any number of awesome protein options. My usual preference, for simplicity’s sake, is grilled shrimp. Can’t go wrong! But I’ve also enjoyed them with other proteins such as chicken, steak, and more luxuriously, crab and lobster. So, you see, you can make a Caesar salad as basic or as snazzy as you like. And for this time around, we went midway on that scale: grilled shrimp! As you’ll see, we made one minor change to this traditional Caesar: we skipped the croutons and made Parmesan crisps for the crunch factor. What’s a Parmesan crisp? It’s crispy Parmesan, of course! And you make them by making little mounds of Parmesan on a sheet of parchment paper, and then microwaving them for about 2 minutes. This salad immediately brought me back to every Caesar I’ve ever ordered and made me realize (how silly of me) how easy they are to make at home! Why haven’t we been doing this for years?! Who knows. But what I do know is that having a Caesar salad at home (this one), where you don’t need to be wearing shoes, is infinitely better than having it at a restaurant where shoes are most definitely required. Except if you’re at a beachside cafe. Then the shoe-rules seem to disappear. And I’m jealous you’re at the beach! I digress. This Caesar salad was awesome. Hitting all of the flavor notes I craved plus the addition of my beloved grilled shrimp, I enjoyed every bite and declared that we will need to make it every week. I just loved it! Source: Recipe by Bryant Ng who is the chef at Cassia in Los Angeles. Find the recipe here. GFMD: This super-flavorful dinner is naturally gluten free. No changes necessary! Outcome: While we always create meal plans that feature a protein of some sort, it's fairly rare (pun intended) that we will have red meat during the week. However, for this week, even I couldn't resist when I saw this recipe for a delicious steak-and-salad combo that I knew Seth would really love, too. He really enjoys cooking steak at home so he was psyched to make this dish. Perfectly-cooked and ultra-juicy rib-eye was sliced and divided onto our plates next to a very full salad of watercress, mint, cucumbers, radish, and sliced hot pepper. A summery mix of greens that was a great contrast to the bold flavor of the steak. While Seth loved the mix of flavors, I was a bit underwhelmed by the salad and I pretty much said I wished it were a potato. Sure, the salad is a much healthier option and I don't normally pass on a bunch of greens next to my protein. But for some reason I thought this steak needed a more grand sidekick. There are plenty of other options that could have gone alongside this rib-eye and most of them, when I began to make a list, involved starch. Yes, I mean potatoes. I suppose my brain was really hoping for a "meat and potatoes" plate and instead it received a "meat and greens" assortment. Not to belittle the salad, which was fresh and fragrant, but for this steak (bold and boisterous), I'd rather have included potatoes as well. How about steak, greens, and a potato? Does that sound good? That way, you get a little of everything and your brain (and stomach) aren't left wishing for more. Source: Recipe by Claire Saffitz for Bon Appétit. Find it here. GFMD: The only change to make is to use gluten free wraps instead of traditional pita. We used plain GF wraps from the brand Toufayan Bakeries which were perfect! Crisp them up in a little of the lamb fat (sounds gross, is delicious) in a very hot pan to get the edges crispy and the color awesome. Voilá! Outcome: Holy tomatoes and hot sauce, why haven’t we been making gyros for years?! They are so easy and combine so many terrific flavors into one, amazing + over-filled, gluten free + crispy wrap! And there’s lamb?!? I’m done. I want this daily. Low and behold, this is the third recipe this week by Claire Saffitz, of Bon Appétit, which I didn’t realize, but hey there, wonderful recipe creator! Your meals are fabulous. They speak to me. The flavors jump at you and are unapologetically bold. I love them. And I cannot wait to make this one again. A crispy lamb gyro is not something I’d have anticipated making at home, simply due to the fact that gyros are notoriously filled with gluten from the pita in which everything is encased. But! That limit is no longer thanks to selecting delicious GF wraps by Toufayan Bakeries which were excellent for this purpose. Every ingredient in a gyro is gluten free so just using a GF wrap is a simple, easy fix. What we loved about this gyro recipe in particular was the mix of flavors: lamb that you let cook until it really is crispy (make a giant lamb pancake, cook it for a while on one side so that it’s super crispy, flip it, cook a little more, then done, essentially) and combine that with crisp lettuce, grape tomatoes, a yummy yogurt sauce, drizzle hot sauce, then you’re on your way to being a flavor fanatic, just like me. Just make sure to cook the GF wrap in the same pan as the lamb (once that’s done) so you can get it crisp-edged and covered in the lamb fat (yup) flavor. Sure, not the healthiest way, but oh my is it good. And sometimes you just need to cook a wrap in hot grease to make it as awesome as it should be. No judgement here! I loved this recipe, I love crispy lamb, and I would love to serve these to friends who have the same lamb-loving mindset. 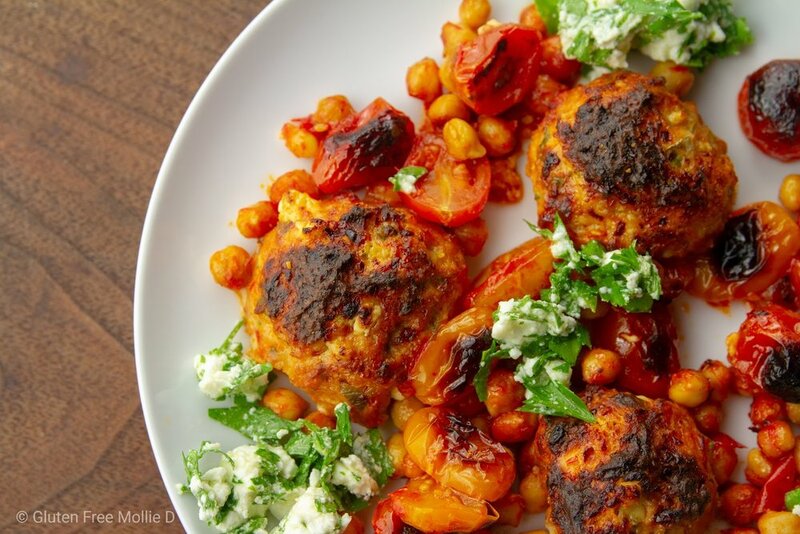 However, you could probably make these with roast chickpeas, or another protein, and have a pretty great outcome as well. My preference is the lamb, but you do you. We are all here to enjoy the foods and flavors we love most. Friday + Weekend: This weekend was filled with a great variety of activities, delicious meals, and getting myself organized for the week ahead. Find below the highlights of our days off as well as quick reviews for everywhere we ate! All restaurant headings are clickable links that will bring you directly to their website. - I finally got a haircut on Friday night! Now, I know that's not too exciting, but I don't do this very often, despite being so thrilled once I get a new cut. My summer style feels fresh and much lighter. Happy to no longer default to a ponytail everyday! - We went to the GFAF Expo on Saturday in Worcester, MA which is the largest allergen-free expo in the US. It was so fun to check out a large number of gluten free products, meet some of our gluten free friends, and have so many delicious samples along the way! Our favorite brands were represented well (Aleia's and Jovial) and I was excited to find a few more products that I'm sure we will begin incorporating into our meals - the Elmhurst Non-dairy milks were excellent. It was pretty incredible to see such a huge turnout and the look of joy on every attendee's face knowing they could safely sample every product offered. A gluten free paradise! If you went to the expo, which products were your favorite? - On both days we visited our families and that's always a perk to include in our weekends. We are all busy so it's extra special when we're able to take time out for actual visits and spend time together. Family time is ultra-important to us, always. Gluten free raspberry cake made by Seth's mom. So good! - I continued my baking adventures! My recent foray into blueberry muffins was a sweet success, which I shared on Instagram, and look forward to making them again. On Sunday, I also decided to try another cookie recipe that I know you'll just love. I think cookies will always be my default baking project because they are straight forward and create something delicious that's shelf-stable and easily shared. Who doesn't love cookies? While I can share cakes and other pastries, there's something about sharing (and eating!) freshly-baked cookies that I will always enjoy. Here's a hint about this next batch: toasted coconut! Toasted coconut - you will love it. Kale-packed scrambled eggs: breakfast after baking! It's hard not to love every moment spent in this beautiful, welcoming, and fun restaurant. Yes, it's the hotel bar for the Fairmont Copley, but honestly, that's what makes it (to me) even better. From the moment you arrive you're transported away from the hustle of Copley Square outside, and urged to relax, unwind, and have some really great food and drinks. We have been going to this spot for several years due to its central location, upbeat atmosphere, and great service. Not to mention the food! While there is not a specific gluten free menu, much of it is already GF and can be adjusted to be served that way. Lately, I've found that every single item I select has been gluten free! On our most recent visit, I had roasted cauliflower and Merguez lamb meatballs which were both unbelievably delicious. And, I had to splurge for fries because the fryer was cross-contamination free - a special treat to joyfully kick off my weekend! Having written about this wonderful restaurant before, I'm sure you know how I will go on and on about its excellent gluten free menu, extensive cocktail offerings, and terrific waitstaff. Once again, I am supplying the same opinion because it's just that good. I have a tendency to go back again and again to restaurants that offer delicious, safe GF food in an atmosphere that's both lively and calming all at the same time. How is that possible? Well, in this specific instance, we landed in the bar a little later than usual and the early-dinner crowds had mostly left, leaving the restaurant with a medium-level hum of busy. It was still filled with guests, but there was a calm overtone encouraging everyone to take their time and enjoy each bite even more. And enjoy we did! I had a filet mignon that was just incredible along with creamy polenta and perfectly-seared scallops. A major feast that was (for me) entirely gluten free and entirely worth it. A peak at our full table is below. A restaurant that's paving the way for allergen-awareness in the food industry, Burton's has a gluten free menu that is almost identical to the regular one. In fact, I'm pretty sure you can order just about everything they offer! A casual atmosphere, friendly staff, and a menu that's got you covered, we love coming here to have late lunches or dinner because we know how easy and safe it will be. We hope you had a wonderful weekend, too! Whether you're busy with activities, relaxing with friends, or grabbing delicious food at one of your favorites hangouts, we hope it was great and you enjoyed every minute. Cheers to summer weekends! Off to dinner in Boston on Friday night!